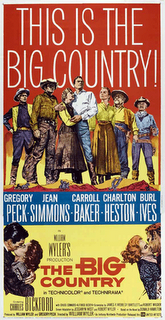 I'm not a fan of westerns, however, one of my favorite movies of all time is The Big Country, starring Gregory Peck, Jean Simmons, Carroll Baker, Charlton Heston, Burl Ives, Charles Bickford, and Chuck Connors. This is a great film, with an amazing cast and an unforgettably awesome musical score! 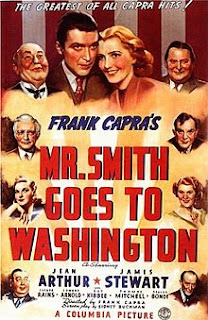 I fell in love with this motion picture when I was in middle school--back in the days of the CBS late night movie. Anybody out there remember those, or am I the only one? I enjoyed The Big Country so much, that as an adult I purchased it on video--as you can tell, that was quite a few years ago. I haven't gotten around to ordering it on DVD yet. The setting of the story helped to inspire part of my upcoming novel, Masquerade: Book Two of the Unchained Trilogy. 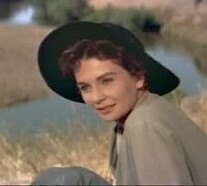 Masquerade is not a western, but the hero and heroine of part one, Escape, eventually end up in California where they raise their family on a huge ranch. 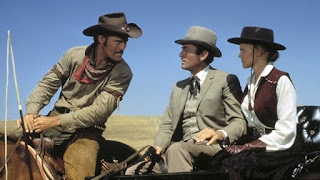 The Big Country actually takes place in Texas (though filmed in California), as an easterner, the honorable Jim McKay (Gregory Peck), moves there to be with his fiance, Pat Terrill (Carroll Baker), whose family owns an enormous ranch. In Masquerade, a New Yorker ventures to California in search of answers. Although the plots aren't similar, (The Big Country focuses on two clans fighting over water rights, while Masquerade revolves around the revelation of true identities), I love the feel of the West portrayed in The Big Country. Watching it inspired my writing, and Chuck Connors's bad guy, Buck Hannassey, inspired one of my characters. And yes, I admit, I re-crafted a little of his dialogue for one of my scenes! My kids love Chuck Connors in reruns of the Rifleman television show, but they'll probably hate him after watching The Big Country--he plays such an excellent dirt-bag. They'll hate Burl Ives too, the jovial grandfatherly folksinger of "Holly Jolly Christmas" and "Frosty the Snowman." He plays Connors's father, a senior dirt-bag, and he did it so well, he won a best supporting actor Oscar! Here's a great article at the Bijou Blog for some fun behind the scenes facts! If you haven't seen The Big Country, it's worth renting--even if you don't like westerns! It's actually based on on the serialized magazine novel Ambush at Blanco Canyon by Donald Hamilton. Do you like westerns? Have you ever seen The Big Country? I can't believe Thanksgiving is Thursday--three days from now! I made this dessert last year and it was a hit. It's also all natural, and I'm making it again this year. Now, in addition to the chocolate cream pie (from my son's school fund raiser) and the store bought pecan pie (from the grocer's freezer), I'll have something for the health conscious among us. This pie recipe is adapted from a very old magazine, although I'm not sure which one. 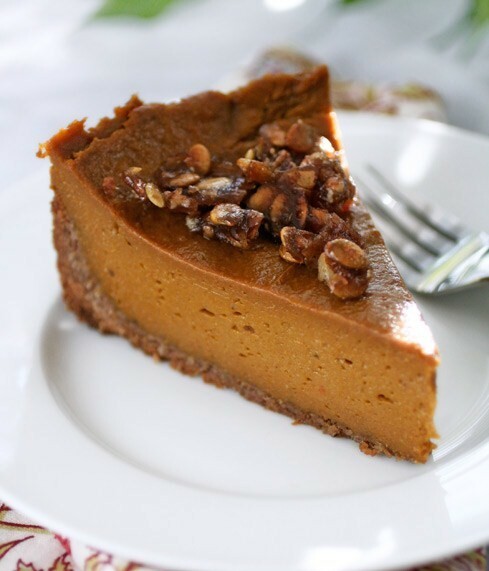 It uses a variety of spices that gives the pumpkin filling a fantastic flavor! Have a wonderful Thanksgiving, and Happy Eating! Spray a 9" pie plate with cooking spray. Line with with nut crust (see below). Preheat oven to 350. In a large bowl beat eggs slightly. Add pumpkin, honey, spices and salt. Beat until well blended. Slowly stir in coconut milk. Pour into nut crust. Bake 60-70 minutes, or until a knife inserted in the middle comes out clean. Combine all ingredients in food processor. Spray a 9" pie plate with cooking spray. Press nut crust mixture along bottom and sides. I grew up eating sweet potato pie on Thanksgiving, instead of pumpkin, but I love both! Which do you prefer? Thanks for visiting and have a great week! Today is the last stop of my blog tour for Escape! I'll be at Romance University discussing how to write realistic dialogue. Please stop by and say hello! If you're not familiar with Romance University, it's dedicated to helping writers establish and advance their careers, it introduces readers to a variety of authors, and it delves into the ever-inscrutable male mind. So if you're a reader or a writer, Romance University is a great place to hang out--hope to see you over there! For reading and writing, what are some of your favorite sites? Before starting today's post, please be sure to visit me for a giveaway of Escape over Romance Book Haven on Wednesday, November 7th, where I'll be discussing some of my favorite movie lines! I don't know about you, but I've had enough of radio and television ads for all the candidates, but I never tire of a good movie! What are some of your favorite political movies? Thanks for visiting and have a great week!